Have you noticed how movies begin these days? Not too long ago, movies always began with lengthy (and boring) credits. Now movies are more likely to jump right into the action – a chase scene, a bank robbery, maybe a violent explosion or two. Some films cut to credits after a tempting tidbit of plot. Others just save credits until the very end. I think movie makers have realized how important it is to capture the audience’s attention right away. Good writers should know how to do this too. You may be familiar with the classic form of poetry known as the epic. The Odyssey, The Iliad, The Aeneid, and Paradise Lost are famous examples. Even in ancient Greece, writers understood the importance of gripping the reader right off the bat. That’s why epics employed the convention of beginning a story in medias res. This is a Latin expression meaning “in the middle of things.” Epics rarely begin at the beginning. They start with some exciting action and then go back and fill in how they got there. WriteAtHome.com Gets Kids Writing Better! Homer’s The Odyssey, for example, begins with the hero, Odysseus, held prisoner by the nymph, Calypso, and yearning for home. It has been ten years since he and his Greek allies won the Trojan War and set out for home. Later in the story, at a banquet, Odysseus tells of his adventures over those ten years. This is not a bad way to structure a story. 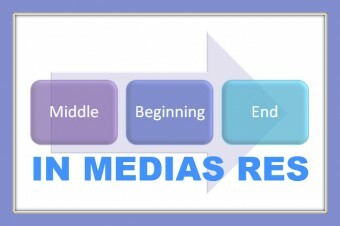 In fact, there are several different ways to begin a story in medias res that can help snag your reader’s interest early. “Ow!” Mike cried, yanking his index finger from the window sill to his mouth. His other hand held tightly to a small but strangely heavy briefcase. The writer of this passage chose not to begin at the beginning by explaining where the boys were coming from and what they’d been up to. Instead, he jumps right into the action, leaving the evening’s adventures a mystery to be revealed later in the story. This is a simple technique that can be used in all sorts of narrative contexts. It’s a common and often effective way to scramble the time sequence of your story. For your next narrative paper, think about how you might begin in medias res. Bloggers love comments. Please leave yours below.